From the second she graced our television screens, Married At First Sight bride Elizabeth Sobinoff has made a very strong impression. Yes, her excitable persona, sassy attitude and her dramatic first meeting with 'husband' Sam was one thing – but it was Elizabeth's striking appearance that really got our heads spinning. 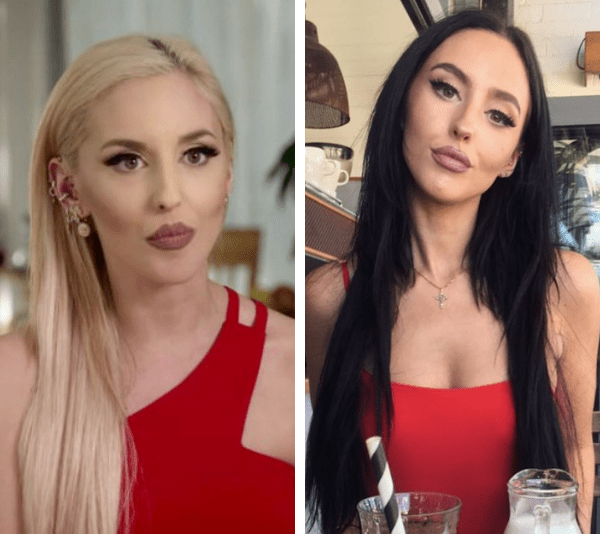 With hair extensions that caused a momentary Twitter meltdown and an eye-watering amount of makeup smothered over her face, the confident blonde wasn't shy of expressing herself outwardly – and it's all for a very surprising reason. Speaking exclusively to Now To Love, Elizabeth revealed that she's well aware she looks different – but she, quite frankly, doesn't care. "It's like playing grown up dress ups," she said. "I love to experiment, and some people are like 'oh you shouldn't' and I'm like, why not?!" And the blonde-bombshell will happily be the first to admit her appearance "isn't to most people's tastes". "But I want to bring something different to it!" she explained. And don't think Elizabeth's current bold look is forever – in fact, going by her track record we could see an entirely different physical side to her before the season is over. "I'm changing all the time, I never look the same, I look like a completely different person about three times a year," she explains. The 27-year-old had Twitter up in arms in her debut episode when viewers saw her completely fresh-faced without any makeup on, with many saying she looked much better without the war paint. But Elizabeth was adamant: "I love full glam, I love to have my lashes on, hair extensions, I always like to have my nails done, I mean I love jewellery… I mean, I love it all," she revealed on the show. Extravagant makeup aside, fans were also losing it over Elizabeth's hair extensions as she prepared to walk down the aisle. The retail manager from Sydney was called out for the striking additions to her dyed-blonde locks, with one fan writing on Twitter: "Worst. extensions. ever". But as it turns out, there was more to the fashion faux-pas than what we previously thought. Telling Now To Love that she had only recently dyed her hair to blonde from black, the 27-year-old simply hadn't had time to get her new extensions camera-ready before filming began. "I went from permanent black to platinum, and unfortunately the process of filming was right in between that," she explained. "I was just like, 'I don't care'. So now when people are having a meltdown about my hair it's like… really? Calm down – it gets better!" That's not to say the blonde isn't shy of going without her trusty extensions. An unearthed photo of Elizabeth rocking a shorter bob hairstyle swept across the internet shortly after her wedding aired on national screens, and it's left us hoping she might ditch the extensions for good! Sam and Elizabeth's nuptials also caused a stir on the social media sphere when both bride and groom expressed some shock body-shaming comments about one another – out of earshot. Sam revealed privately that he'd "never really dated girls as big as Elizabeth in the past, to be honest." Fans were quick to react to his comments, taking to Twitter to share their thoughts. "Did he just assume she has body image issues because he thinks shes "big"????? ?," one fan wrote. Meanwhile, Elizabeth was also heard uttering her own initial thoughts about Sam as she walked up the aisle: "Does he look porky? He looks tubby." But during her chat with Now To Love the blonde bride was quick to clear things up: "I was so nervous and it was just verbal diarrhoea. I apologise if that has hurt anyone's feelings. I am so sorry, it was literally down to a lot of stress on the day." Sam has been less apologetic for his comments, telling TV WEEK that he's "an honest guy, and that was the honest truth". While admitting that Elizabeth wasn't a big girl, he said that she was "just a little bit bigger than girls I normally date." "Health and fitness is huge for me and I was a bit concerned when I saw Elizabeth. I just hoped she'd want to live an active lifestyle too," he said. Speaking to Now To Love, Elizabeth said the comments hadn't phased her. "I love myself, so get to know my personality then," she said. Want more Married At First Sight? We’ve got you covered!